0	0	Isaiah	In Stock - Order before 2pm for same day dispatchWant it on Wednesday 24 April? The book of Isaiah has been called "the Bible in miniature." Both are comprised of sixty-six sections-chapters in Isaiah, books in the Bible. Isaiah first chronicles a holy God's need to judge sin, reflecting the Old Testament, as latter chapters preface the New Testament, revealing the mercy to come through God's Son. This study examines a sweeping narrative of Israel, and explores the very arch of God's redemptive story, as sin and judgment are defeated through the grace of our Savior. The Wiersbe Bible Studies Series explores timeless wisdom found in God's word. Based on Dr. Warren W. Wiersbe's popular "BE" series, each study provides topical, relevant insights from selected books of the Bible. Designed for small groups, this eight-week study features selected commentaries from BE Comforted, engaging questions, and practical applications, all designed to help you connect God's word with your life. Isaiah by Warren Wiersbe was published by David C Cook in November 2010 and is our 9705th best seller. The ISBN for Isaiah is 9780781404235. Isaiah is a chunky, chewy and complete Old Testament segment. 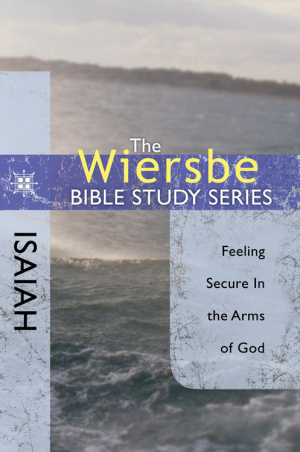 Warren Wiersbe offers a great little series of accompanying bible studies to his prolific Be-commentaries, with this being interpreted as dominantly about Being Comforted 'Feeling Secure in God.' This is a light, spacious, title that offers sizeable sections of the original commentary with accompanying questions in a roomy format that renders this more as a workbook. Isaiah may rightly be understood as the bible-in-miniature but this resource didn't fully honour the scale of scripture and it's implications. The eight 'lesson'-chapter format was light more than effective or comprehensive enough to serve its intended small group resource. More space for scribbling than substance so other readers might feel a little short-changed! Got a question? No problem! Just click here to ask us about Isaiah.